A tabletop role-playing game, pen-and-paper role-playing game, or table-talk role-playing game is a form of role-playing game (RPG) in which the participants describe their characters' actions through speech. Participants determine the actions of their characters based on their characterization, and the actions succeed or fail according to a formal system of rules and guidelines. Within the rules, players have the freedom to improvise; their choices shape the direction and outcome of the game. Unlike other types of role-playing game, tabletop RPGs are often conducted like radio drama: only the spoken component of a role is acted. This acting is not always literal, and players do not always speak exclusively in-character. Instead, players act out their role by deciding and describing what actions their characters will take within the rules of the game. In most games, a specially designated player called the game master (GM) also known as DM (dungeon master) creates a setting in which each player plays the role of a single character. The GM describes the game world and its inhabitants; the other players describe the intended actions of their characters, and the GM describes the outcomes. Some outcomes are determined by the game system, and some are chosen by the GM. The terms pen-and-paper and tabletop are generally only used to distinguish this format of RPG from other formats, since neither pen and paper nor a table are strictly necessary. Most games follow the pattern established by the first published role-playing game, Dungeons & Dragons. Participants usually conduct the game as a small social gathering. 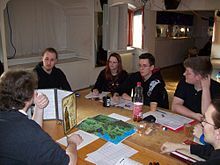 One participant, called the Dungeon Master (DM) in Dungeons and Dragons, more commonly called the Game Master or GM, purchases or prepares a set of rules and a fictional setting in which players can act out the roles of their characters. This setting includes challenges for the player characters to overcome through play, such as traps to be avoided or adversaries to be fought. The full details of the setting are kept secret, but some broad details of the game world are usually given to the players. Games can be played in one session of a few hours, or across many sessions depending on the depth and complexity of the setting. The players each create characters whose roles they will play in the game. As well as fleshing out the character's personal history and background, they assign numerical statistics to the character; these will be used later to determine the outcome of events in the game. Together, these notes tell the player about their character and his or her place in the game world. The GM then begins the game by introducing and describing the setting and the characters. The players describe their characters' actions, and the GM responds by describing the outcome of those actions. Usually, these outcomes are determined by the setting and the GM's common sense; most actions are straightforward and immediately successful. For example, if a player has their character look around a room, the GM will describe the room; if they have their player leave, the GM will describe whatever they encounter outside the room. The outcomes of some actions are determined by the rules of the game. For example, while looking around the room, a character may or may not notice an important object or secret doorway, depending on the character's powers of perception. This usually involves rolling dice, and comparing the number rolled to their character's statistics to see whether the action was successful. Typically, the higher the character's score in a particular attribute, the higher their probability of success. Combat is resolved in a similar manner, depending on the character's combat skills and physical attributes. In some game systems, characters can increase their attribute scores during the course of the game (or over multiple games) as the result of experience gained. There are alternate game systems which are diceless, or use alternate forms of randomization, such as the non-numerical dice of Fudge or a Jenga tower. Games are of indefinite length, from a single brief session (usually completed in a few hours) to a series of repeated sessions that may continue for years with an evolving cast of players and characters. Play is often episodic and mission-centric, with a series of challenges culminating in a final puzzle or enemy that must be overcome. Multiple missions played with the same characters may be related to each other in a plot arc of escalating challenges. The exact tone, structure, pace and end (if any) vary from game to game depending on the needs and preferences of the players. The assumption of roles was a central theme in some early 20th century activities such as the game Jury Box, mock trials, model legislatures, and "Theatre Games". In the 1960s, historical reenactment groups such as The Sealed Knot and the Society for Creative Anachronism began to perform "creative history" reenactments introducing fantasy elements, and in the 1970s fantasy wargames were developed, inspired by sword and sorcery fiction, in which each player controlled only a single unit, or "character". The earlier role-playing tradition was combined with the wargames' rule-based character representation to form the first role-playing games. Dungeons & Dragons, developed in 1974 by Dave Arneson and E. Gary Gygax and published by Gygax's company, TSR, was the first commercially available role-playing game. TSR marketed the game as a niche product. Gygax expected to sell about 50,000 copies total to a strictly hobbyist market. After establishing itself in boutique stores, it developed a strong, lasting fan base. Empire of the Petal Throne, released in 1975, introduced the concept of critical hits. Using these rules, a player who rolls a 20 on a 20 sided die does double the normal damage, and a 20 followed by a 19 or 20 counts as a killing blow. According to creator M.A.R. Barker, "this simulates the 'lucky hit' on a vital organ." Another early game was Traveller, designed by Marc Miller and first published in 1977 by Game Designer's Workshop. This was originally intended to be a system for playing generic space-opera-themed science-fiction adventures (in the same sense that Dungeons & Dragons was a system for generic fantasy adventures), but an optional setting called "the Third Imperium" that was detailed in subsequent supplements became strongly identified with the game. The changes in this setting over time, especially those involving "the Fifth Frontier War" as depicted in the Journal of the Travellers Aid Society, arguably constitute the first use of metaplot in a role-playing game. Meanwhile, Call of Cthulhu and Paranoia offered different role-playing experiences, in which the story arc of a group's investigation would lead to death and/or madness, or where comical infighting within a group would be expected and reinforced within the genre conventions of "a darkly humorous future". At the same time, games using the fictional worlds of Star Trek, DC Heroes, the Marvel Universe or The Lord of the Rings expanded the range of possibilities for tabletop gaming. Dungeons & Dragons was a subject of controversy in the 1980s when opponents such as Patricia Pulling claimed it caused negative spiritual and psychological effects. Academic research has discredited these claims. Some educators support role-playing games as a healthy way to hone reading and arithmetic skills. Though role-playing has been generally accepted in society, the subject retains a level of controversy among some religious organizations. This belief or attitude is by no means universal among religious organizations; there are faith-based role-playing games on the market and religious role-players who disagree that these games are morally corrupt or occult in nature. Due to the game's success, the term Dungeons & Dragons has sometimes been used as a generic term for fantasy role-playing games. TSR undertook legal action to prevent its trademark from becoming generic. Games such as GURPS and Champions also served to introduce game balance between player characters; later, Vampire: The Masquerade and similar games served to emphasize storytelling, plot and character development over rules and combat. In recent years, rules stringency has been combined with literary techniques to develop games such as Dogs in the Vineyard that stress player input to give players moral agency in the course of the emerging story. Competition from role-playing video games and collectible card games led to a decline in the role-playing game industry. The financially troubled market leader TSR, Inc. was eventually purchased by Wizards of the Coast. To better cope with the economics of role-playing games, and to combat growing bootlegging problems, they introduced a new regime of open gaming, allowing other companies to publish D&D-compatible supplements. Meanwhile, self-defined "Indie role-playing" communities arose on the internet, studying role-playing and developing several forms of role-playing game theory such as GNS Theory, and critical reflection on role-playing games has become popular in Scandinavia leading even to a yearly academic conference. In thirty years the genre has grown from a few hobbyists and boutique publishers to an economically significant part of the games industry. Grass-roots and small business involvement remains substantial while larger projects have attracted several million players worldwide. Games industry leader Hasbro purchased Wizards of the Coast in 1999 for an estimated $325 million. The set of rules of a role-playing game is known as its game system; the rules themselves are known as game mechanics. Although there are game systems which are shared by many games, for example the d20 system, many games have their own, custom rules system. 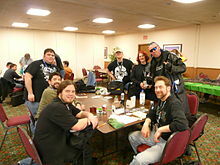 Most role-playing games require the participation of a gamemaster (GM), who creates a setting for the game session, portrays most of its inhabitants, known as non-player characters (NPCs) and acts as the moderator and rules arbitrator for the players. The rest of the participants create and play inhabitants of the game setting, known as player characters (PCs). The player characters collectively are known as a "party". During a typical game session, the GM will introduce a goal for the players to achieve through the actions of their characters. Frequently, this involves interacting with non-player characters, other denizens of the game world, which are played by the GM. Many game sessions contain moments of puzzle solving, negotiation, chases, and combat. The goal may be made clear to the players at the outset, or may become clear to them during the course of a game. Some games, such as Polaris and Primetime Adventures, have distributed the authority of the GM to different players and to different degrees. This technique is often used to ensure that all players are involved in producing a situation that is interesting and that conflicts of interest suffered by the GM are avoided on a systemic level. Game rules determine the success or failure of a character's actions. Many game systems use weighted statistics and dice rolls or other random elements. In most systems, the GM uses the rules to determine a target number though often the targets are determined in a more principled fashion. The player rolls dice, trying to get a result either more than or less than the target number, depending on the game system. Not all games determine successes randomly, however; an early and popular game without random elements is Amber Diceless Roleplaying Game by Erick Wujcik (1990). Most systems are tied to the setting of the game they feature in. However, some universal role-playing game systems can be adapted to any genre. Basic Role-Playing (1980) was the first of these, adapted from the fantasy RPG RuneQuest. The following year Champions was published; it was accompanied by a number of sourcebooks w (collectively called the Hero System) allowing play in a wide range of genres. 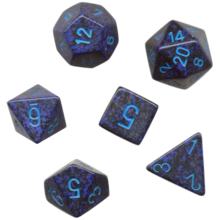 The d20 system, based on the third edition of Dungeons & Dragons, was used in many modern or science fiction game settings such as Spycraft and the Star Wars Roleplaying Game. In practice, even universal systems are often biased toward a specific style or genre and adaptable to others. For example, although the d20 system has sourcebooks for modern and futuristic settings, most published d20 system material stays within Dungeons & Dragons' combat-focused fantasy milieu. Characters in role-playing games are usually represented by a number of statistics. Statistics are an abstract measure of how successful a character is likely to be at a class of tasks. Many game systems make distinctions between two key types of statistic: attributes and skills. Some, such as Burning Wheel and The Shadow of Yesterday include character motivations among these resources. These names are not at all consistent across different games, however. Attributes are statistics all characters possess: strength, agility, and intelligence are common examples. These are ranked, often on a numeric scale, so that a player can gauge the character's capabilities. For example, a character's strength rating could be used to determine the likelihood that the character can lift a certain weight. Skills are abilities that only some characters possess, such as negotiation, horseback riding, and marksmanship. Game systems often define skills that are genre-appropriate. For example, fantasy settings generally include magic skills, while science-fiction settings may contain spaceship piloting skills. However, some skills are found in several genres: a medieval rogue and a Wild West outlaw may both be very proficient at throwing knives, and a skill labeled "diplomacy" may benefit ancient Greek patricians or industrial tycoons of the 19th century equally well. Character motivations are things that the character will fight for. The Riddle of Steel's Spiritual Attributes, Burning Wheel's Beliefs and The Shadow of Yesterday's Keys are such features. They might reveal secrets the character has kept, aspirations they hold, or other characters they care about. Before play begins, players develop a concept of the role they would like to play in the game. They then use the game system's character creation rules to form a representation of their characters, in terms of game mechanics. The character's statistics are recorded on a special-purpose form called a character sheet. Some systems, such as that of Feng Shui, require characters to choose from a set of pre-built template characters with only a small amount of customization allowed. Others, like the d20 System, use character classes to define most character concepts, but allow some freedom with the statistics within those classes. Still others, such as GURPS, allow the player to create their own character concepts by freely assigning statistics. Game statistics are not a substitute for a character concept. For example, one Wild West gunfighter may become a quick drawing revolver marksman, whereas another with similar game statistics could be a mounted rifle expert. Many systems take this into account, requiring statistics to be described, such as Dogs in the Vineyard's Traits and Possessions. Template-based systems have the advantage of easy and quick character creation. It also provides the GM with the means to spend less time approving each character for play. The sacrifice is in flexibility and concept. Templates are essentially pre-built characters that are balanced against each other and pre-approved by the game companies. Class-based systems give slightly more freedom but still require a player to choose from a set number of roles for their character. The character's powers are generally set by the character class, but the specific statistics are assigned by the player. Character point-based systems, such as Hero System, allow complete freedom of concept. The downside is that, in many cases, character creation is much more complex, making the GM spend a lot more time examining and approving each character concept. A few games allow free-form character creation. Characteristics are simply assigned as a player sees fit, and the final result is submitted to the GM or group for approval. Free-form character creation can be implemented in any game system, but is only rarely the prescribed or assumed method. Each game has a setting in which adventures and campaigns can take place. Usually a campaign setting is designed for a specific game (such as the Forgotten Realms setting for Dungeons & Dragons) or a specific genre of game (such as Medieval fantasy, World War II, or outer space/science fiction adventure). There are numerous campaign settings available both in print and online. In addition to published campaign settings available for purchase, many game masters create their own. Campaign settings exist for almost all genres of fiction; however, because the world's most popular role-playing game, Dungeons & Dragons, is part of the fantasy genre, fantasy is also the most played role-playing genre. RPGs of the fantasy genre are sometimes collectively called "Fantasy role-playing games" ("FRP"). The use of the term "world" in describing a campaign setting is loose, at best. Campaign worlds such as the World of Greyhawk detail entire cosmologies and time-lines of thousands of years, while the setting of a game such as Deadlands might only describe one nation within a brief segment of alternate history. There are three primary types of campaign setting. The first exists in genre- and setting-specific role-playing games such as Warhammer or World of Darkness which exist specifically within one setting. The second type of setting is for games that have multiple settings such as modern Dungeons & Dragons or those that were developed specifically to be independent of setting such as GURPS. The final type of setting is developed without being tied to a particular game system. Typically this last sort are developed first as stand-alone works of fiction, which are later adapted to one or more role playing systems such as the Star Wars universe or Middle-earth. The range of genres represented by published settings is vast, and includes nearly all genres of fiction. While role-playing's roots began in fantasy, science fiction has been used in settings such as Traveller, horror formed the baseline of the World of Darkness and Call of Cthulhu while Spycraft was based in modern-day spy thriller-oriented settings. The comic book and superhero genres have been utilized for games such as Mutants and Masterminds. A number of campaign settings have fused multiple genres into a single game. Shadowrun combined fantasy with Cyberpunk, Castle Falkenstein drew on fantasy and Steampunk elements, and Torg mashed up fantasy, science fiction, pulp and horror elements while Feng Shui combined Chinese historical fantasy with Kung Fu action tropes and dystopian science fiction. In GURPS Infinite Worlds, the characters play "Infinity Patrol" agents who travel to alternate worlds, some if which include fantasy or steampunk as well as science fiction elements. The largest publisher of role-playing games is Wizards of the Coast, a wholly owned subsidiary of Hasbro and publisher of Dungeons & Dragons, the D20 Star Wars RPG, and a number of smaller D20 titles. Most analysts give White Wolf the second largest industry market share, and the highest share in live-action games. Most role-playing game publishers are privately held companies and do not release sales figures, making precise estimates difficult. There has been no publicly available, systematic examination of point of sale data, limiting further estimates to a rough consensus between industry analysts whose conclusions are often controversial. Market research conducted at Wizards of the Coast in 1999-2000 indicated that more than 1.5 million people played D&D on a monthly basis, and about 2 million people played all tabletop RPGs combined on a monthly basis. The success of the 3rd Edition of Dungeons & Dragons likely resulted in an increase in those totals. These figures for play are substantially larger than the figures for sales. In 2006, non-Dungeons & Dragons tabletop RPGs in the upper echelons of sales typically generated between five and ten thousand unit sales. Most commercially published RPGs are small press products, having less than a thousand units sold. The technology of print on demand is strongly used in RPGs, since it reduces run costs for the typical small print runs. Role-playing games are produced under a variety of business models, which succeed or fail based on those models' objectives. The smallest viable businesses are one person companies that produce games using print on demand and e-book technologies. Most of these companies provide a secondary income for their owner-operators. Many of these businesses employ freelancers, but some do not; their owners complete every aspect of the product. Larger companies may have a small office staff that manages publishing, brand development and freelance work. Guided by a developer/manager, freelancers produce most of a game line's content according to a central plan. Finally, a few companies (such as Wizards of the Coast and Mongoose Publishing) maintain an in-house writing and design staff. direct sales via the internet, through an online retailer or through the company's own electric storefront. electronic sales and distribution, either without any physical product at all (e-books) or through a POD service. Once limited to small companies, this sales venue is now employed by publishers of all sizes. attendance at conventions and events; this is particularly common among live-action games. Typically, RPG publishers have a very long life cycle once they manage to generate an initial successful game. TSR, the initial publisher of Dungeons & Dragons was an independent entity until 1997 when it was acquired by Wizards of the Coast, who was subsequently acquired by Hasbro in 1999. Many of TSR's contemporaries remain in business as independent publishers. The core design group of a publisher is often kept as a team within the new company for the purposes of continuity and productivity, though layoffs are common after such mergers and acquisitions. For example, Wizards of the Coast experienced multiple layoffs in the wake of acquiring Last Unicorn Games and after its own acquisition by Hasbro. The Game Publishers Association (GPA) was formed to assist adventure game publishers. The stated goals of the GPA include facilitation of communication between game publishers and others in the gaming community and promotion of the adventure gaming industry as a whole. The GPA maintains a member database, publishes a mailing list, and offers a "press exploder" tool which issues press releases to game-related outlets. The association guidelines are published on the organization's website. Indie games are produced by a self-identified independent games community, or individuals who identify with that community. Generally they are self-published or published by a collective group of small publishers. The indie role-playing game community often produces games with signature and idiosyncratic character. Some indie publishers often eschew the three-tier distribution model and sell directly online and at conventions, or directly to stores, but many do use distribution services. The line between "indie" publishers and "mainstream" publishers is hazy at best. Varying definitions require that commercial, design, or conceptual elements of the game stay under the control of the creator, or that the game should just be produced outside of a corporate environment, or be distributed without dependence on the industry's three-tier retail structure. Homebrew games are game systems designed by amateurs, most often for use by one gaming group. The term refers to a group's GM making or 'brewing' his or her unique set of rules to fit the campaign setting, or to appeal to the specific interests of the players. The term 'Homebrew' can describe anything from customizing an existing commercial product (by adding or changing a few minor rules), to creating an entire standalone system. Most long-running campaigns will eventually develop into a homebrew state, as "in house" rules, misunderstandings or selective application of rule-system accumulates. A few homebrewed games are designed to be redistributed and modified by the use of open content licenses, such as the Yags, and WikiRPS systems. The decision to license the game under permissible conditions allows the cultivation of homebrew communities, similar to the ones found with popular open source projects.